It was Sunday and we were driving….to the tennis court of all places. ‘Maybe we should stop at home and get some snacks and water,’ I suggested, seeing as it was lunch-time. The professor obliged and steered the van towards our domicile. He pulled up to the curb and I jumped out with the car keys, since we never seem to carry more than one set of house keys between us. I raced around so as to minimize the wait for the passengers. I filled tupperware containers with fruit snacks and pretzels. I filled a water bottle….with water. I grabbed bug spray and my camera so as to be able to document the day the Gort begins to fulfill his athletic destiny. And, with my reusable shopping bag slung over my shoulder, I marched back outside and shut the door behind me. Before I managed to grab the keys from the hook. I knew right away what I’d done. I yelped, as if yelping would somehow keep the door from shutting all the way and I’d be able to push it open and grab the keys that were still dangling from the very hook where I’d placed them when I walked inside the house five minutes earlier. I made my way along the walkway towards the car-van, where the professor was happily reclined in his seat. Taking a five-minute cat nap. Sensing my presence, he looked up. ‘I locked the keys inside the house,’ I told him. Quickly, as though ripping off a two-week-old band-aid from a hairy patch of skin. As he disappeared behind the house with a screwdriver in his hand. It had been a banner week chez Johnson for incredibly-stupid-self-inflicted-things. Eight days prior, we’d descended upon the Superstore to pick up some groceries. Percy had screamed bloody murder because the professor had had the audacity to try and push him around the store…in a stroller. So the oldest and youngest band members abandoned us before we’d even made it to the cosmetics aisle. Choosing to continue their scream session within the confines of the van. Forty minutes or so later, when I climbed back into the car-van with the Gort and the Hen and our groceries (including ice cream), the car would not start. The battery had been thoroughly depleted. Luckily we’d failed to lock the back door, which saved us from having to unearth screwdrivers and attempt to break in to our own home. Which brought us to Sunday and the latest in our series of familial faux-pas. 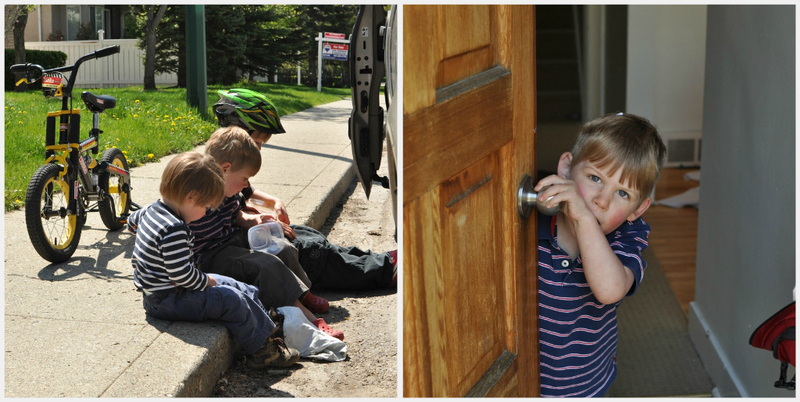 The boys crawled out of the van onto the sidewalk and ate all of the snacks. The oldest two rode their bikes up and down the sidewalk, while we waited for the professor to perform his magic. ‘Henners,’ the professor suddenly called, ‘I need you’. Which I took to mean victory was imminent. Especially after my better half said ‘does he know how to unlock the front door? A Hen-sized opening had been created….somewhere….and soon the front door would open and I’d be able to get the car keys. And the extra set of keys I vowed (then and there) to hide in a secret location. Twenty-four hours later, as I was typing up this pathetic tale, it occurred to me: didn’t I blog about this very thing last year? Except instead of tennis…..it was baseball. I think the bottom line for the Johnsons, besides travel with an extra set of keys at all times, or make sure you have the keys before leaving the house at all times.……is avoid athletic activity. or you can leave a set with me! We installed a little lock box on our front door. It has a little compartment where we keep a spare key, has a combination lock. Seemed a neccessity after years of the lady of the house locking herself out! Now my fear is someone using it and failing to put it back. Ugghh. Oh, so we got back after being gone for 12 hours to find my keys still in the lock. This after having to test the “find my iPhone ap” not so very long ago. My poor husband….. he is so patient with my and my un-perfectness. Julie, thanks goodness for trustworthy neighbors! Leo, I may take you up on that offer. I’m giving myself two weeks to improve. Rachel, I had totally forgotten about the ‘detective’ aspect of my original post, so I was kind of amazed by the coincidence! And backing up a car has never been my strongsuit. Thank goodness for the backup beep alert thingy in the car (WHEN it’s on……) Roberta, a combination lock box would be perfect for me. Though Jason might forget the combination! Kristen, glad I’m not the only one!!! Just as well I don’t have an iphone….